Dirt, dust, powders and other contaminants threaten product quality, safety and health. 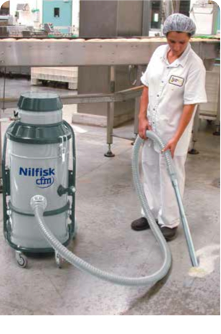 Nilfisk vacuums are trusted by NASA, the U.S. armed forces, and the nation’s top food and pharmaceutical manufacturing companies Withi highly-efficient HEPA filtration systems Nilfisk and Nilfisk CFM industrial-strength vacuums quickly and easily capture virtually every particle of debris. 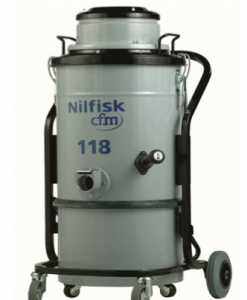 Designed with the safety professional in mind—equipped to collect hazardous and potentially dangerous dust, from food scraps to pharmaceutical powders to bulk materials. 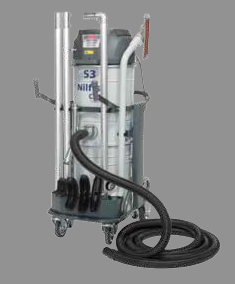 Whether you are cleaning the tight corridors of a passenger train, decontaminating a cleanroom, or complying with OSHA. The S Series is designed in a variety of configurations, such as a membrane switch keypad with LED indicators that monitor filter performance. Standard features include a manual filter shaker to quickly clean the main filter, oversized handle for easy push/pull transport, accessory storage tray, cable holder and more. – Filter Area: 19.33 sq. ft.